Henry Holt is expediting publication of Michael Wolff's Fire and Fury book about the Trump White House. Early excerpts from the book have already ignited a firestorm and damaged the relationship between President Trump and Steve Bannon, former Trump campaign ceo and White House Chief Strategist. Trump's personal attorney sent a cease-and-desist letter to Henry Holt in a last-minute attempt to quash publication of the book. This legal strategy failed. The publisher is speeding up the release date instead. The book was expected to be released on January 9th. It will now be released tomorrow, January 5. It has already topped the bestseller list on Amazon.com as a pre-order. 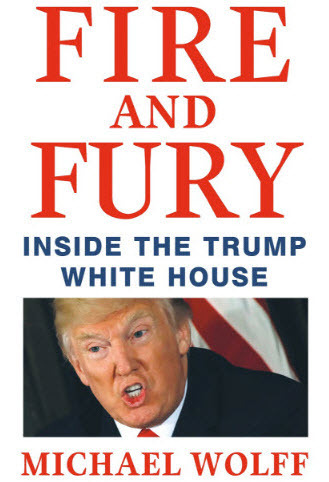 CNN reports that a spokesperson for Henry Holt told them, "Due to unprecedented demand, we are moving the on-sale date for all formats of Fire and Fury by Michael Wolff, to Friday, January 5, at 9 a.m. ET, from the current on-sale date of Tuesday, January 9." Author Michael Wolff shared the news in a tweet. He writes, "Here we go. You can buy it (and read it) tomorrow. Thank you, Mr. President." Wolff claims to have hours of tapes backing up the quotes in his book. White House Press Secretary Sarah Huckabee Sanders called Fire and Fury a "ridiculous book of lies" today at the White House press briefing.